The Mayor of London and Transport for London launched their cycle safety action plan last week. Tragically, two London cyclists were killed by lorries in two separate shocking collisions within 24 hours of the launch of the plan. My heart goes out to the family and friends of Muhammad “Haris” Ahmed, 21 years old, and Shivon Watson, 28 years old. Muhammad and Shivon are the second and third cyclists to die in collisions with lorries in London so far this year, after University professor David Vilaseca-Perez, 46, was run down by a skip lorry near his home on the South Bank. There will be more (much more) about the relationship between trucks and cyclists on this blog over the forthcoming weeks, but in the interim I would ask that you reflect on the tragic nature of these lost lives, and, if you're a cyclist read my previous article about sharing the road with large vehicles, the main theme of my advice being this: no matter how much of a rush you are in keep the hell away from large vehicles, and never, ever, travel down their inside - even if it is to get to Advanced Stop Line bike at the front of traffic lights. After close proximity collisions, the largest source of deaths and serious injuries for cyclists (17%) comes, perhaps surprisingly, from OTHER vehicles disobeying junction controls. To clarify, that means that 17% of cyclists killed or seriously injured have been hit as a consequence of other vehicles jumping red lights or not giving way at stop signs. By contrast, cyclists jumping red lights into the path of oncoming traffic represent just 5% of casualties (1 fatality and 22 seriously injured.) Unfortunately the statistics are not detailed enough to reveal whether the cyclist jumped the red light as a consequence of just 'being in a rush' or to put distance between themselves and other traffic (for example HGVs), or whether there was an ASL box at the junction they jumped and whether or not this was occupied by other vehicles. The cycle safety plan has many other points and action plans, and is generally a much stronger document than the draft which was widely consulted on last year. Plus points include boosting training provision for cyclists to coincide with the launch of the cycle hire and cycle superhighway schemes, and continuing to support London boroughs to fund cycle training for residents. (Incidentally, for those who didn't know, all London boroughs now offer cycle training for free or at a highly reduced rate. Even if you consider yourself an 'advanced' cyclist, if you've never taken your quota of free lessons I strongly recomend you do.) Other positives include working with the London Criminal Justice Board to review cycling casualty stats with a view to strengthening criminal justice arrangements for dealing with such cases, and trialling 'trixi' concave mirrors at traffic lights to aid large vehicle drivers to be able to see down the left hand side of their vehicles and to check that there are no cyclists trapped down there before they move off. Sadly, for all of the good in the plan, there is one key problem that greatly concerns me: there is no timetable within it for the implementation of any of the measures outlined. Call me a cynic, but I'm sure that politicians have expressed intentions before, but without a firm timetable for delivery there is no guarantee that they will actually do any of the things listed. Lastly, in the light of the deaths at the beginning of the week my thanks to those of you who wrote / emailed and Tweeted the Mayor and asked him to acknowledge them. Eventually he did so, describing them as 'tragedies' and encouraged his 70,000 twitter followers to watch the new cycle safety video and to watch out for cyclists. A small step, but let's hope that they do. This is a great advert. I hadn't seen it before. I'm about to start cycling to work in London and I am scared by how dangerous the roads are but I'm looking at making a route so I use quiet streets and keeping off the main road as much as possible! This advert has definitely reminded me that I can't always rely on the cars to see me! Hi Jo, thanks for stopping by. Glad you enjoyed the advert - I like it too, think it's quite clever. Good luck starting with your cycling to work: you've timed it perfectly - as spring has spring the streets are full of cyclists and it really does make you feel safer in a pack. I can't reccomend highly enough, if you feel nervous about the big roads and the traffic, taking your free cycle training lesson - your local Borough should provide them and have details on their website. It's a bit like a driving lesson, only for cyclists, and unlike a driving lesson the stuff they teach you will stay with you forever and keep you safe. They teach you to ride dominantly and put yourself in the safest position and all the rest of it: never mind spending any money on a helmet or a nice bag and all the rest of it; these lessons are much more worthwhile! That all said, cycling in London isn't nearly as scary as you might think and generally most road users are quite considerate. 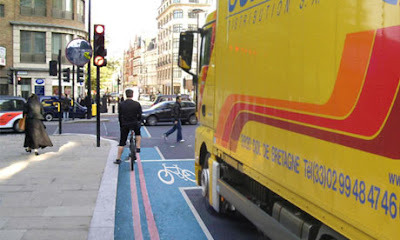 My only advise would be as stated above; keep as far away as possible from HGVs / large trucks and busses at junctions and never filter down their inside, even if there is a filter lane leading to an advanced stop line ('bike box') at the traffic lights. All the rest is fair game and I hope you learn to love it - once you get the bug there's no going back you know!